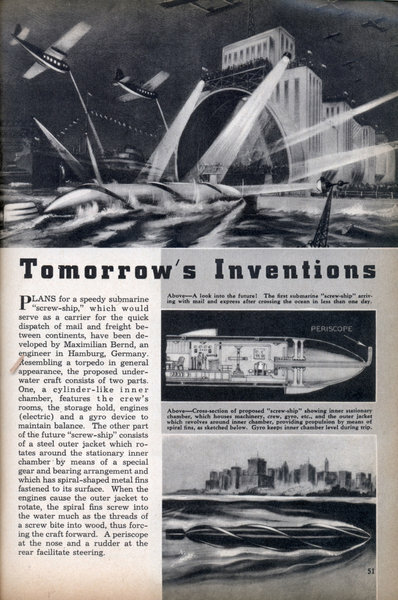 PLANS for a speedy submarine "screw-ship," which would serve as a carrier for the quick dispatch of mail and freight between continents, have been developed by Maximilian Bernd, an engineer in Hamburg, Germany. Resembling a torpedo in general appearance, the proposed underwater craft consists of two parts. One, a cylinder-like inner chamber, features the crew's rooms, the storage hold, engines (electric) and a gyro device to maintain balance. 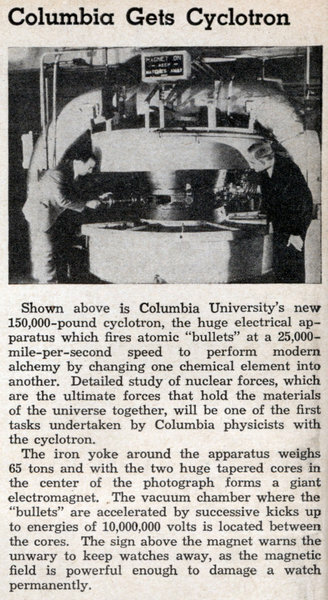 Shown above is Columbia University's new 150,000-pound cyclotron, the huge electrical apparatus which fires atomic "bullets" at a 25,000-mile-per-second speed to perform modern alchemy by changing one chemical element into another. Detailed study of nuclear forces, which are the ultimate forces that hold the materials of the universe together, will be one of the first tasks undertaken by Columbia physicists with the cyclotron. 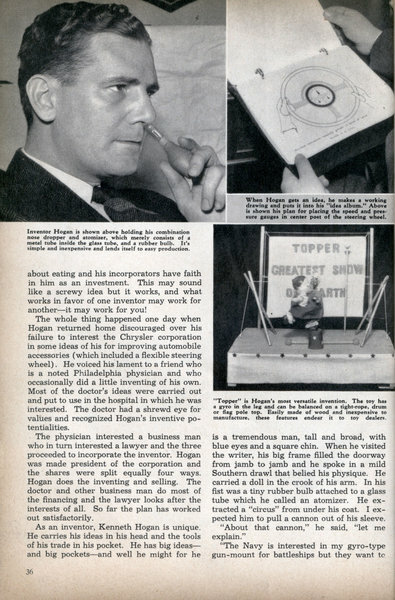 by Stanley Gerstin This is the story of a unique inventor who licked his money problems by incorporating himself to win financial backing until the money starts rolling in. WHAT should the inventor do until the money starts coming in? This is a serious question that has stumped many inventors. But here is the story of one who licked the problem. He is Kenneth P. Hogan, of Philadelphia, an ingenious inventor who got himself incorporated. Three men put up dough for the corporation and sent the inventor into a huddle with himself to invent something. Our Air Force - A Farce! 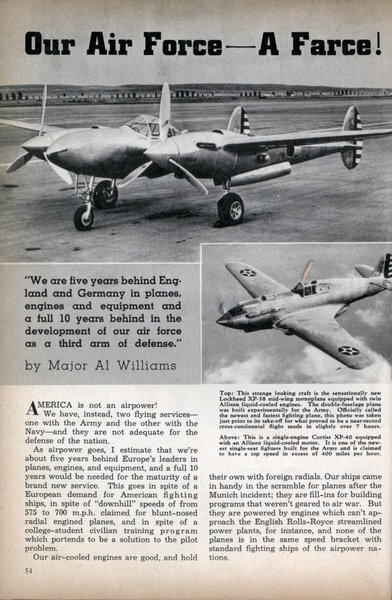 "We are five years behind England and Germany in planes, engines and equipment and a full 10 years behind in the development of our air force as a third arm of defense" by Major Al Williams AMERICA is not an airpower! We have, instead, two flying servicesâ€” one with the Army and the other with the Navyâ€”and they are not adequate for the defense of the nation. As airpower goes, I estimate that we're about five years behind Europe's leaders in planes, engines, and equipment, and a full 10 years would be needed for the maturity of a brand new service. This goes in spite of a European demand for American fighting ships, in spite of "downhill" speeds of from 575 to 700 m.p.h. 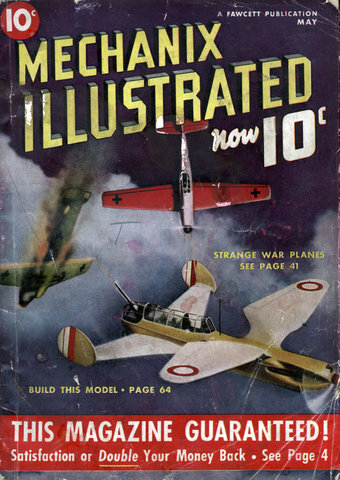 claimed for blunt-nosed radial engined planes, and in spite of a college-student civilian training program which portends to be a solution to the pilot problem. Our air-cooled engines are good, and hold their own with foreign radials. Our ships came in handy in the scramble for planes after the Munich incident; they are fill-ins for building programs that weren't geared to air war. But they are powered by engines which can't approach the English Rolls-Royce streamlined power plants, for instance, and none of the planes is in the same speed bracket with standard fighting ships of the airpower nations. Suppose doctors said you had only ten days more to live! What would you give to have another ten YEARS of life? "Anything in the world !" you would say. Unfortunately, it would be too late. NOW, while you have many years more to live, is the time to fortify yourself against later troubles.